We’re gonna start and end with Deadpool! Behold the best and most creative fans we encountered this year at the Chicago Comic & Entertainment Expo (C2E2)! If anyone sees themselves and wants to be identified in the post, just shoot us an email at terrordaves@gmail.com! I am a huge fan of toys; always have been, always will be. Growing up, I always leaned towards toys with a science fiction theme for my hours of playtime fun and some of my favorites were Mego’s Micronauts and the World’s Greatest Super-Heroes 8″ action figure line as well as the original Kenner Star Wars toys. 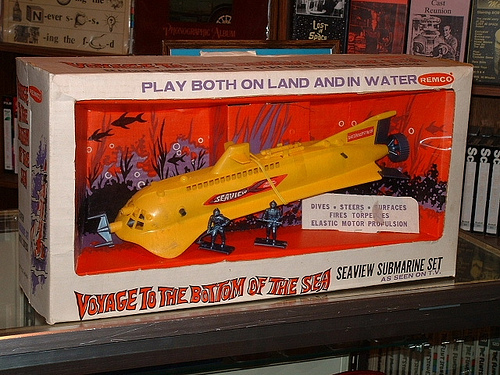 While researching this article, and the toy company REMCO, I found that I also had a lot of what they had to offer back in the day. They may not have been the largest toy-making company but they did offer a wide variety of toys that made us boys drool when we saw the commercials or saw them offered in the annual Sears Catalog Christmas Wishbook.